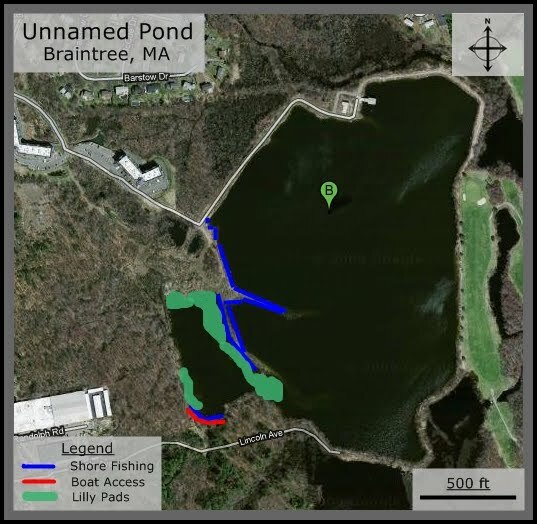 Last summer I fished Richardi Reservoir in Braintree with some success but lots of trouble figuring out how to access it. There's two access points, only one of which I have used up to this point. There is an apartment complex across the street from Messina Drive on Pond St, which if you go through there parking lot, will lead you to a path down to the water. According to Google Maps, you can also access this pond via Lincoln Ave off of North St. This pond is pretty large but has limited shore fishing access. If you use the Pond St access point, it will lead you to a set of peninsulas, allowing you to fish 3 distinct segments of the pond. The largest, most northern segment (on your left as you come in from Pond St) drops off quickly from the shore and seems to be pretty clear of weeds. I watched a couple kids bring in some bass over there as I was leaving. I mainly fished the opposite side on the western part of the pond. There are some trees and bushes lining the shore so its challenging to find a spot but I caught a couple bass here but saw several large breaks out just a little past where I could reach. I am definitely interested in heading back here to see what I can make of it. If you're interested, I saw two people putting a canoe into the water by the Lincoln Ave access point. That is probably the best way to fish this pond since the shore fishing is very limited by the pond is quite expansive. Good luck! Successful Bait: Worms- Black, Watermelon Green. Crankbait- Shallow diving silver pattern. Is it 2 ponds, separated by a dyke? If yes, is Great Pond and Great Pond Upper. NO BOATS!,,and, you may want to keep out of easy view. I've been told by some Water Dept guys'no fishing', others have said,'keep near the cover of trees' ,while others have said, "any luck?" There are alot of nice largemouths, bulky Smallies and jarasic pickerel.Haven't been for several years since moving to central ma., but, usually have some pretty good success. There are several small ponds, (water sheds), around the edges that produce. Just an FYI: Access on Pond St: They are privately owned condos and not an apartment buildings as stated. Parking is assigned .